Please check the ISBN that your instructor provided. If the ISBN-13 does not match this product (9781337102681) or its Printed Access Card equivalent (9781337102698) this may not be the correct product. In some cases, you may also require a course code from your Instructor. 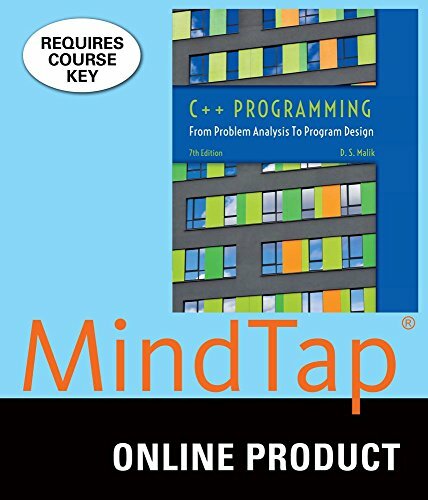 MindTap Computer Science for Malik's C++ Programming: From Problem Analysis to Program Design, will help you succeed in class while also preparing you for your career. Research shows employers need troubleshooters and creative problem-solvers to stay relevant in today's fast-paced technology-driven world. With MindTap you are taken through the basics before challenging you with more difficult activities. The learning path will guide you through text readings that can be read to you and real-life scenarios that sharpen your critical thinking skills. Hands-on labs designed to teach users to write and run code are now seamlessly integrated into MindTap so there is no installation, allowing you to code directly in the Integrated Development Environment (IDE) from your web browser. Powered by artificial intelligence, a chatbot provides hints and feedback when you get stuck, which encourages persistence through on-demand assistance. Throughout the course you will be supported with study tools that help you stay organized and efficient. Flashcards allow you to quiz yourself, and a study guide populates with your highlights and notes to make information easy to find when it's time to work. With MindTap you always know where you stand --- what's due and when, your grades, and how you compare to the highest performers in class. Learn more at http://www.cengage.com/mindtap/. Instructor Assigned: Please be aware that the product you are purchasing is usable only if assigned by your instructor. If your instructor has not assigned this product, you should not continue with your purchase. This product requires a Course Key from your Instructor to fully activate. Please consult your Professor or class syllabus for the specific Course Key. ISBN: 9781337102681 Access to this product is valid for 180 days of usage. After this period, this product can be viewed under the "view expired" link in your CengageBrain account.